Compatible Xerox Solid Ink Sticks, Magenta, 4,400 page yield. Replaces Xerox part number: 108R00927. Solid Ink Sticks compatible with Xerox ColorQube 8570, 8580. 20 out of 20 (100.00%) customers would recommend this product to a friend. I have been using this solid ink for some time and find it to be all it is advertised to be I have encountered no problem. I would recommend this product to my best friend. PS I think all ink is overpriced that's just me. Have been using these for few years now and have had zero issues. Very pleased with the solid ink sticks and with the price. Best price around for compatible ink that works with my Xerox printer! I purchased this product for our non-profit where every penny counts and makes a difference for cancer survivors. Awesome product. Compatibly to the original in every way. Thank you inktechnolgies for helping us save money so we can help others. On our third order of this solid color ink product. It is very close to the Xerox product. No issues with clogging, etc. Great product and easy to find on your site. Thanks!! This works 100% as well as buying the product directly from the manufacturer, but at a fraction of the cost. Ink Technologies is prompt on delivery, too. What I love most is the product is cheap but works like the name brand, and I earn points buying it which saves me even more money!! Work well, seem to give same print quality. Same quality with the great advantage of lower price from OEM! The product seems to be just as good as the Xerox brand. I bought these ink sticks for my Xerox Qube 8750. Considerably less expensive than Xerox product, and they work great! Fast shipping too! Ink Technologies has been great to work with - pricing, tracking, customer service are great! The product is a bit frustrating, and this has more to do with Xerox and their technology. Thanks again! I love how easy to use these are. There is no mess. They last a long time for our needs. These inks work the same as the original inks. Great name brand product at a great price. Shipping was quick and reasonable. Larger cubes means more printing for the money at a lower cost. Product works just as well as OEM cartridges. Much better price than OEM. Cubes function perfectly in my Xerox ColorQube 8570 at much less them OEM prices. Color quality is great! This is the second time I have replaced ink cubes from this company - good prices - good service - fast delivery. Office Depot, Office Max, Staples not even close. Such a great product and the perfect price. Would definitely recommend and will purchase in the future! Compatible Xerox Solid Ink Sticks, Cyan, 4,400 page yield. Replaces Xerox part number: 108R00926. Solid Ink Sticks compatible with Xerox ColorQube 8570, 8580. Qualifies for free shipping & earn 112 points! Compatible Xerox Solid Ink Sticks, Yellow, 4,400 page yield. Replaces Xerox part number: 108R00928. Solid Ink Sticks compatible with Xerox ColorQube 8570, 8580. Compatible Xerox Solid Ink Sticks, Black, 4,300 page yield. Replaces Xerox part number: 108R00929. Solid Ink Sticks compatible with Xerox ColorQube 8570, 8580. Compatible Xerox Solid Ink Sticks, Black, 8,600 page yield. Replaces Xerox part number: 108R00930. 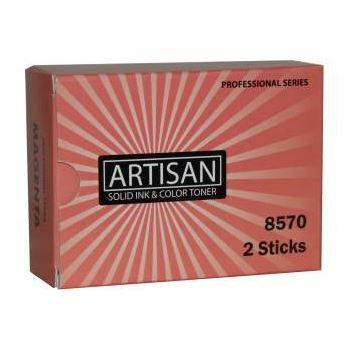 Solid Ink Sticks compatible with Xerox ColorQube 8570, 8580.